“I never had anyone watching from a window for me. You got lucky." 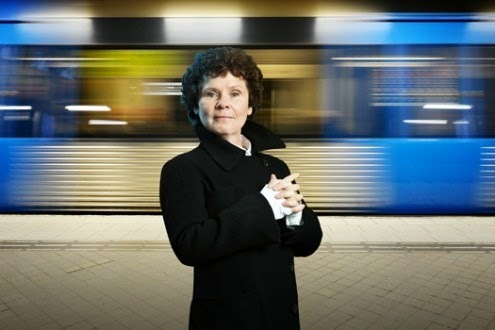 As if there was any doubt that Imelda Staunton wouldn't be excellent… Though the way that she inhabits the part of Margie, a hard-bitten, working-class Bostonian single mother is simply quite astonishing. From the opening moments of this David Lindsay-Abaire play as she faces the prospect of losing the job that is barely keeping her afloat due to the desperation of forlorn hope etched on her face at the end, it is a sensational performance in the midst of a sensational production. Jobs are few and far between in the tough neighbourhood of South Boston and the demands of caring for her disabled daughter mean Margie needs to seize the bull by the horns to get alternative employment. When she hears from a friend that Mike, an old flame is back in town - someone who has definitely gone up in the world to become a doctor - she batters down his door and procures a birthday party invite where apparently somebody might have something for her. Naturally, it doesn't quite unfold like that, Margie’s spiky determination leading to a blistering second act confrontation which is just magnificent and is that rare thing, a dissection of American class politics. Staunton brings an unerring conviction to her idea of what makes a ‘good’ person and it transpires Lloyd Owen’s excellently blinkered Mike has fallen short. Faced with the evidence he has whitewashed from his past, the difference in their lives could not be any starker. Their debate is brilliantly drawn, incorporating the reality of social mobility, the importance (or otherwise) of remembering your roots, the role of the family environment in one’s upbringing, the desperation that financial hardship brings that the well-off can never truly understand. Mike’s college professor wife Kate adds additional levels, coming from money and of African-American descent, showing that the class system in the US is just as mutable and complex as in the UK. Lindsay-Abaire also fills the stage with an astute portrayal of the coping mechanisms and rituals that working class life. So Margie has two pragmatic but loyal friends in the shape of June Watson and an excellent Lorraine Ashbourne, the local bingo hall is presented as a refuge from the realities of life and a place of modest dreams, and the whole thing also crackles with a fiercely sharp sense of humour. Hildegard Bechtler’s revolving set enables the fast pace of Margie’s journey through the social strata of Boston and its rich suburbs, and Jonathan Kent’s production is note perfect from top to bottom, anchored by a sterling performance from someone who must surely be considered one of our finest living actresses.